Unfortunately, buying clothes online might mean that they don’t fit properly. Stop worrying, with these extensive jacket size charts and jacket size conversions, our easy to follow how to jacket size measurement and jacket size guides, men, and women will find their perfect size easily. Just follow our measuring instructions, note down your size in inches or centimeters and use the calculator to find your US or International jacket sizes. But be careful: As jacket sizing logic differs for women’s and men’s sizes, you should read the instructions below carefully. Various body parts need to be measured to allow a perfect fit of your jacket. However, the chest measurement is the most important one, especially if your body proportion can be considered to be “standard” (i.e. your arms are not longer than average). For a looser fit, you should add 1-2 inches to the chest measurement. Besides the chest, sleeve, shoulder and jacket length should also be measured. If you want to purchase a jacket for more casual events, you can choose a looser fitting than for formal events (i.e. suit jackets). How do you measure for a men’s jacket size? Actually, this is quite easy: All measurements are taken close to the body. Please remember not to take any measurements over your regular clothes. Chest measurement: The chest is the most important body part for jacket measurement. Please stand up straight and relax your arms. Optimally, you can ask another person to wrap a tape measure around your chest. Make sure it has a little room (max. an inch) to move. For casual jackets, you can add an additional inch. Waist measurement: The waist is measured in the same way as described above for the chest but around your waist. Jacket length measurement: The ideal jacket length for you will obviously depend highly on the type of jacket which you want to purchase. Standard jacket sizes are made for standard bodies, if you are shorter or taller than average, you should measure your upper body. Measure with the tape measure from the top of your shoulder. For a blazer, measure down to the top of the thigh, for a longer coat measure to just above the knee. How can I know my jacket size? Just measure your height and chest width in either inches or centimeters. Then look up the according size. 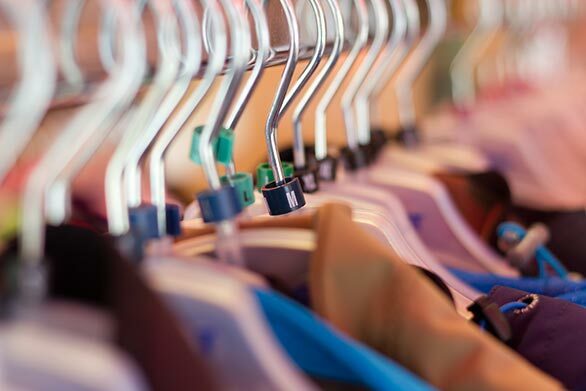 If you need information on kids’ clothing sizes, click here. In some occasions, the jacket sizes for ladies and gentlemen in Europe are divided further. More detailed information about European Sizes can be found here. “Normal sizes” are for 65-68 inch (165-172 cm) body height and correspond to European clothing sizes from 32 to 62. “Short sizes” are for a body height of less than 65 inches (165 cm) and correspond European clothing to sizes from 16 to 29. “Long sizes” are for body heights above 68 inches (172 cm) and correspond to European clothing sizes from 68 to 116. Standard sizes: With a body height of 63-81 inch (160-206 cm) and an evenly proportioned body, jackets in the “Standard sizes” category in European size 40 to 78 should sit correctly. Smaller sizes: In this category, you will find the matching jacket for smaller and a little bit sturdy built men. The jackets are usually generously cut. Tailored models are rather unusual. For slightly smaller men, the jacket should end at hip height. Slim sizes: Men with a slightly narrower bust and a body height between 68 and 78 inches (174-197 cm) are best suited with slim models from European size 88 to 114. They also offer a wide range of wearing options for varying weather conditions. All dimensions should be measured close to the body and hence please remember not to take any measurements over your regular clothes. 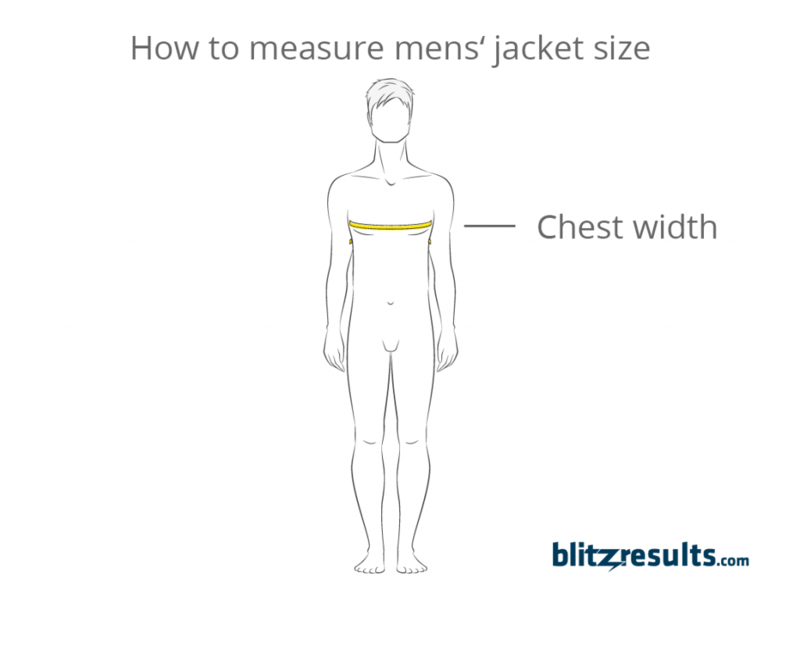 Chest measurement: As mentioned above, the chest is the most important body part for jacket measurement. Stand up straight, relax your arms at your side. Ideally ask your mum, spouse, or best friend, to wrap the tape measure around your chest area. Make sure the tape measure has a little room (max. an inch) to move. Depending on the type of jacket (casual vs. formal) you can add an additional inch (casual can be looser). Measure horizontally around the body at the strongest part of the chest with a tape measure. Hip measurement: The hip is measured in the same way as described above for the chest but around your hip.Measure horizontally at the strongest part of the buttocks. Height measurement: Please take off your shoes as measurements need to be made without shoes, from head to toe. The recommended measuring point is the door frame in which you can stand up straight. How do I find out my jacket size? Measure your chest and hip width in either inch or centimeters. If you chest width in inch is between 34 and 36 inches, and your hip width between 39 and 40 centimeters, your perfect size is “L” (US) or a 40 (European Size). As coats are mostly a more expensive investment, you may want it to last longer. So making sure the fit is perfectly right, is very important. Coats are normally worn over different combinations of clothing (i.e. suits, sweaters, sometimes even jackets). So it is important that the chosen coat does not come in too tight. For business coats, which you will wear in most cases only with a suit beneath, add 1-2 inches onto your coat measurements. For raincoats, you can easily add up to 4 inches depending on your preferred style. As coat cleaning at the dry cleaner can be quite expensive, it can make sense to clean your jacket or coat at home. However, you should not just put it into the washing machine as the jacket or coat can get damaged by that. Here are some tips how to clean your clothes at home. Down jackets, coats or vests can be washed and dried at home. Of course, read the care label before to make sure that the inner and outer fabric is also washable. When washing your down gear at home, you should use a down wash in your washing machine. To avoid wet down clumping, you can add pre-washed tennis balls to the machine. Afterwards out your down clothing in your dryer on low heat. Fleece jackets are made of a synthetic fiber fabric (e.g. polyester). Hence you should not wash it with too warm water and also you should never dry it on high heat. Rather wash it on a washing cycle, with cold water, no excessively fast spinning. Air drying is the best for fleece jackets. If you have to tumble then please only in (very) low heat and remove the fleece jacket while still a little damp. For wool or cashmere coats and jackets it is best to use a mesh bag. Also, you should buy a suitable wool or cashmere soap and use the wool cycle of your washing machine. Waterproof coats or jackets should always be washed in cool water using a special detergent to protect the waterproof finish. Never put the waterproof jacket in a dryer. Always air dry it and use an impregnation spray after washing. Impregnation sprays with NANO particles provide extra good protection against wetness and stains. For odor removal, you can fill a spray bottle with vodka and spray your jacket or coat with it. This will kill bacteria and remove any odors immediately. Hang up your coat in your bathroom while taking a hot shower. The steam from the shower will steam the coat and kill bacteria and eliminate odors. Anorak: The anorak is a weatherproof hooded jacket originally from Greenland. Annoraaq means something against the wind. And in fact, even for us today, an anorak is a hip-length and well-lined jacket with a hood to protect against wind, moisture, and cold. Blazer: The term “blazer” no longer covers only the navy blue club jacket with golden buttons. It is wider and more diverse. Blouson: The blouson (also blouse jacket) is tight at the waist and has a close-fitting cuff. It blouses out and can hang over the waistband. Their forms range from flight jackets to college jackets. Feather down jacket: A very breathable and warm jacket. If the down jacket goes clearly over the hip, it is called a feather down coat. Leather jacket: A functional garment made of leather. Suit jacket: A formal men’s jacket which is often worn with a suit pant but can also be combined with jeans or other pants nowadays. Parka: The parka is the big brother of the anorak. It is a robust short coat with hood and often complemented fur optics. Its name derives from the Inuit culture and is worn accordingly as a strong and warming coat during the winter months. In olive green, the parka is a classic for the German Armed Forces and the military, with two large pockets in the pelvic area providing plenty of storage space. Also typical is the liner lining as a strong heat source. As a robust classic of the 1970s and 1980s, various designers have rediscovered the parka in recent years, often combining it with jeans. Raincoat: The raincoat is a classic protection against bad weather. It has been worn for generations and is made of rubber in traditional variations from Macintosh to frieze mink. In recent decades, waxed cotton fabrics (Barbour) have become more popular as a material, and the production of PVC as a real plastic coating is still customary. Raincoats made of the above-mentioned materials are not breathable, which is why openings for air conditioning are used. Innovative substances such as Gore-Text or Sympatex have solved this problem with the help of climate membranes. In all variants, the protective character of the raincoat is in the foreground, which is why it is usually long cut and has a hood as well as a high collar. Trenchcoat: The trench coat is a special raincoat made of light cotton fabrics like poplin. Its name indicates its original meaning as a trench cover for soldiers during the First World War. What was part of the basic equipment of the British army a few decades ago has been worn with great pleasure for civilian purposes for decades. Thomas Burberry is the inventor of the long coat with different types of closure and without a hood. Cape: The cape or pelerine is a wide cut cape without sleeves, which is made for men and women. Instead of the sleeves there are often slit openings, often with fixed or removable hood. Very often the special coat is used as a rain cape, in black the cape is a classic addition to the tailcoat. In the seventies, loden capes were an integral part of women’s streetwear. Today, capes have become somewhat out of fashion, although they are convincing due to their protection against wind and weather. In the last few years, various fashion designers have rediscovered the cape for themselves and offer it in classic or unusual variations in different lengths for men and women. Duffle coat: The Dufflecoat is a special coat for the autumn and winter months. Compared to other coats, the duffle coat distinguishes itself primarily by solid and warm woolen fabrics, which give it its unmistakable look. A hood is a typical component of every duffle coat, the same goes for the attached pockets and the so-called toggle clasps, which can also be worn in a stylishly opened way. Various body parts need to be measured to find a perfect-fitting jacket: (1) chest, (2) sleeve, (3) shoulder, (4) waist, and (5) jacket length. Once you have these measurements, you need to refer to a jacket size chart (as provided in this article) to find your corresponding clothing size. In European sizing, jacket sizes are classified by gender and further by body height. For women, European sizes fall into one of three groups: (1) normal (65-68 inch [165-172 cm] body height), (2) short (body height of less than 65 inches [165 cm]), and (3) long (body heights above 68 inches [172 cm]) sizes. Men’s sizes are divided according to standard (body height of 63-81 inch [160-206 cm]), slim (body height between 68 and 78 inches [174-197 cm]) and smaller sizes.